Note: Prices shown are based on both transacted and listed prices. Adjustments are made where necessary for variations in size, specific location, design, condition and improvements, if any. Note: Rents shown are based on both contracted and listed rents. Adjustments are made where necessary for variations in size, specific location, design, condition and improvements, if any. New launches in Johor Baru in 3Q2018 all comprised landed properties, which have since achieved sales of between 60% and 80%, according to KGV International Property Consultants Sdn Bhd executive director Samuel Tan. He notes that most of the schemes were launched in small numbers, in multiple phases, of 100 to 300 units. The healthy sales rate is testament that there is still demand for landed properties. “No high-rise residential scheme was launched in the quarter under review … such projects have practically come to a halt,” he says in presenting The Edge-KGC International Property Consultants Johor Baru Housing Property Monitor 3Q2018. “Based on the latest official statistics, as at 1H2018, there were about 41,000 high-rise residential units at various stages of construction that remain unsold nine months after they were launched. This represents 87% of the total of 47,000 unsold residential units. Developers continued to focus on clearing their existing unsold stocks,” he adds. Phase 1 in Taman Desa Tebrau (100 units of 2-storey cluster homes sized from 2,490 to 2,598 sq ft); Phase 1C at Glenmarie Johor (56 units of 2-storey semidees, measuring 2,598 to 3,054 sq ft); Ayera Residences Phase 1 (179 units of 2-storey terraced homes, 1,713 to 2,250 sq ft); and The Straits View Homes (273 units of 2-storey terraced homes, 2,173 to 2,420 sq ft). 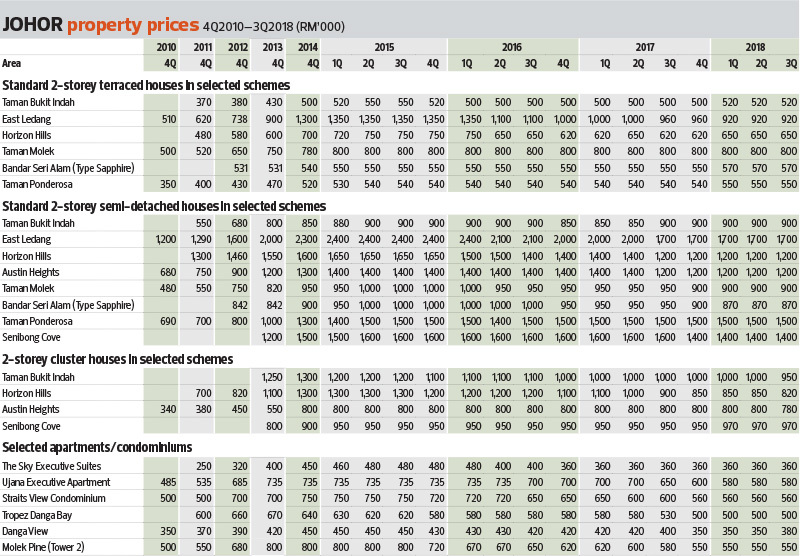 Meanwhile, prices for properties within selected schemes remained largely stable in the quarter under review with the exception of 2-storey cluster houses in Taman Bukit Indah, Horizon Hills and Austin Heights, which dropped by between RM30,000 to RM50,000, KGV data shows. Tan explains that this could be an indication of buyers’ preference for cheaper terraced houses, which are normally priced from RM500,000 to RM600,000, compared with cluster houses that cost RM800,000 and above. 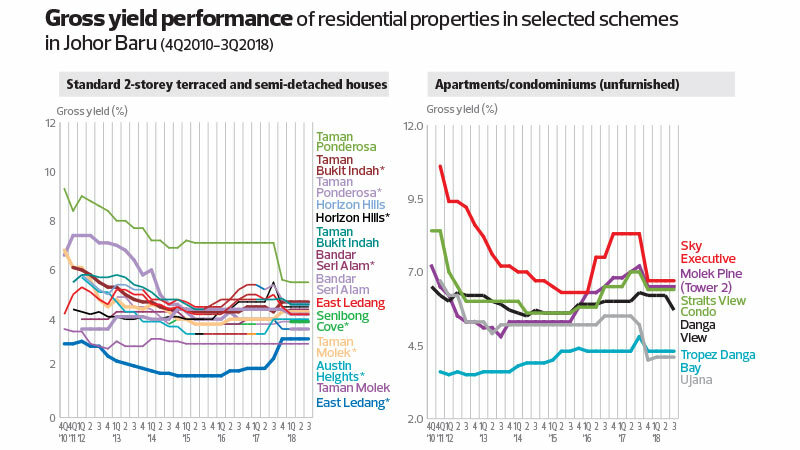 The price of two-storey cluster homes in Taman Bukit Indah (land area: 2,240 sq ft) dropped to RM950,000 from RM1 million (down 5%), while similar units with the same land size in Horizon Hills fell to RM820,000 from RM850,000 (down 3.5%). In Austin Heights, 2-storey cluster homes land size: 2,240 sq ft) dipped 2.5% to RM780,000 from RM800,000. “Meanwhile, average transacted prices of Danga View Apartment rose from RM350,000 to RM380,000. This could be due to buyers taking advantage of the relatively lower price per unit of less than RM400 psf,” Tan says. 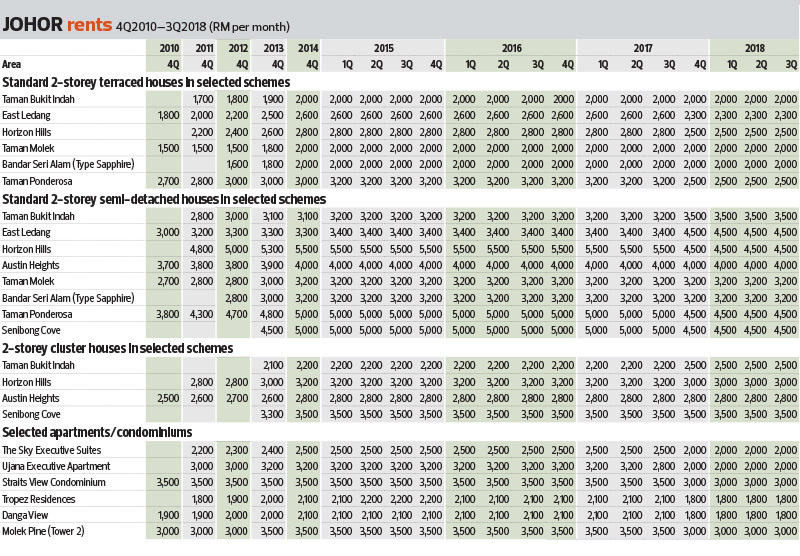 The RM30,000 increase translates into growth of 8.5%. With a built-up of 1,037.6 sq ft, that works out to RM366 psf. There was no change in rents. 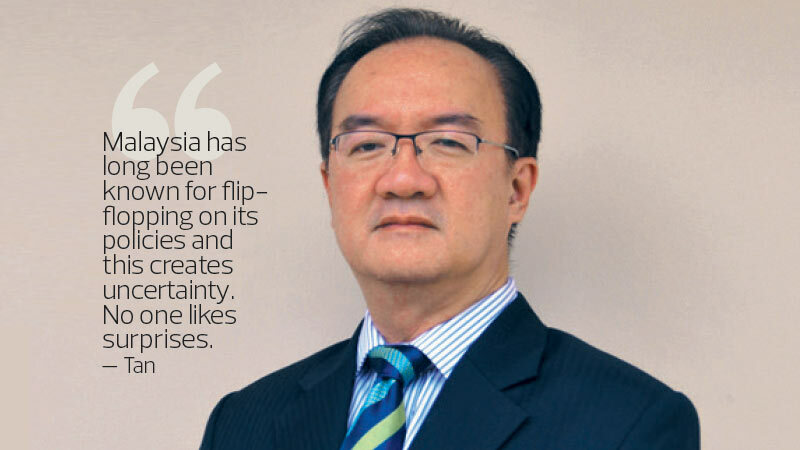 Tan notes that global macro-economic uncertainties have affected the property market, which remains quiet. The trade war between the US and shows no signs of abating in the short term, and a further escalation between the two super powers will lead to detrimental consequences for the global economy. In addition, as the US Federal Reserve moves to normalise the interest rate after years of quantitative easing post the global financial crisis, Tan expects one more 25-basis point increase by year-end. At least another three 25-basis point increases are expected next year, he adds. On the local front, major events in the quarter under review included the announcement by Prime Minister Tun Dr Mahathir Mohamad that foreigners will not be allowed to buy residential units in Forest City and that no visas will be issued to foreigners buying properties. Tan says the brief statement, without any further details, may give rise to unintended consequences. Foreigners buying properties in Forest City and other residential projects in Malaysia, he says, have to abide by the rules as set out under federal and state policies. These include the foreign buyer quota, stipulated threshold (RM1 million for foreigners in Johor) and special exemptions granted within international zones. Foreigners applying for long-term visit passes under the Malaysia My Second Home (MM2H) programme must fulfil the criteria stipulated by the authorities. “If it is the intent of the government to fine-tune the policy with regard to property purchases by foreign buyers, the message could perhaps be delivered in a more judicious manner. More importantly, much thought should be given to the rationale, possible impact on various stakeholders and methodology of implementing the new policy,” he says. Meanwhile, it was widely anticipated that property prices will drop because building materials have been exempted from the Sales and Service Tax (SST). The government has warned that it may retract the exemption if the savings are not passed on to buyers. “Nevertheless, we are given to understand that the buyers will only enjoy the savings if all players in the property development process pass on the savings to the subsequent parties. Therefore, developers, contractors, subcontractors and building material suppliers all play a part in lowering house prices. It becomes a lose-lose situation if all parties in the process do not make an attempt to ensure the cost savings are passed on,” Tan says. Another key development for the state was that Malaysia and Singapore agreed to defer the commencement of the high-speed rail (HSR) project by two years — to May 31, 2020 — instead of cancelling it. Tan maintains that the HSR, if planned and implemented effectively, will be a catalytic project that will provide mutual long-term benefits to both countries. To minimise wastage and inefficiency, it is important to ensure that the cost of the project is well managed, the project is executed professionally, and maintenance is carried out diligently, he adds. “During this review period of two years ... consider carefully the alignment as well as impact on developments along the HSR line and respective train stations. More thought should also be given to the connecting transport modes and incidental amenities. We cannot afford to have another grand project that over-promises but under-delivers,” he says. Tan notes that in Iskandar Malaysia, an immediate beneficiary of the HSR will be the Gerbang Nusajaya area as the proposed Iskandar Puteri HSR station will be located in this township. The HSR is targeted to be operational in January 2031. The issue of improving connectivity between Malaysia and Singapore does not stop here. 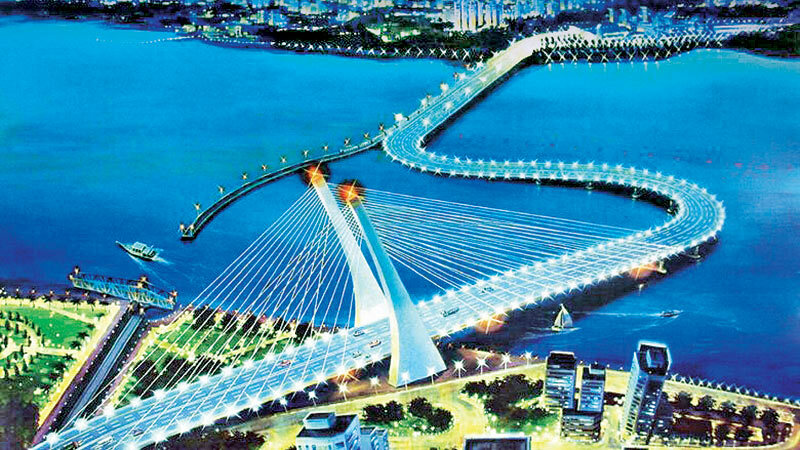 There are also plans to build a third bridge via the Sungai Rengit area in Pengerang, Kota Tinggi and Pulau Ubin in Singapore. “Our humble opinion is that the immediate priority is to resolve the longstanding traffic congestion at the Causeway Link and Second Link. Traffic practically chokes up at the Customs checkpoint and there is a bottleneck during peak hours. It becomes worse on weekends and public holidays,” Tan points out. Instead of a third bridge, he suggests that other measures be considered, such as building a dedicated covered walkway, opening up more counters at the immigration checkpoint and sending traffic police to control the traffic during peak hours.